A 6 CD, 77 track compilation of the very best music from one of the most accomplished and prolific composers in film music history. His 30 year career is simply breath-taking, writing music for over 100 films that have grossed over $22 billion, eight Academy Award nominations including one win, two Golden Globes, three Grammys, an American Music Award and a Tony. From 1988’s South African political drama A World Apart and then through three decades of Hollywood blockbusters including Gladiator, Pirates Of The Caribbean and Batman to 2014’s The Amazing Spider-Man 2, this is a musical overview of a truly magnificent talent. A man revered for bringing together electronic music and traditional orchestral scoring he is also happy to undertake extensive research to bring period music to films such as The Last Samurai and Sherlock Holmes. These new recordings provide the perfect overview to his glittering career. John Barry Prendergast OBE remains Britain’s greatest film composer with a career spanning over half-a-century that features some of the greatest scores ever written. His astounding Oscar haul for Born Free, The Lion In Winter, Out Of Africa and Dances With Wolves doesn’t even touch upon his legendary 11 James Bond scores and countless other epic themes such as Zulu, The Ipcress File and Midnight Cowboy. Silva Screen has long been an archive for the genius of John Barry, hunting down missing cues and scores from his 100 plus film compositions that have never previously appeared on CD. 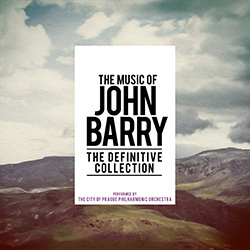 The original 4CD set John Barry: 40 Years Of Film Music has sold over 30,000 copies in the UK. This 6 CD set greatly expands that repertoire with 119 tracks from 68 film and TV productions ranging from Juke Box Jury in 1959 to his swansong Enigma in 2001. A stunning collection of music from an icon of cinema.